When life feels unsettled and the road ahead is pot-holed at best, what better way to recalibrate than with a few close Hoppers and a cozy round of izakaya classics? We Hoppers have been frankly reeling from recent events and, while we will refrain from overt political discourse in these Hoppie pages, suffice to say we have perhaps never needed more or better comfort. Let’s just say we knew exactly where to go. So hop we did to a long-overdue reunion to Umonoie, an unassuming little haunt on the Lower East Side. The welcome upon arrival is warm, the tables low to the ground, and shoes are definitely off. Here we could curl up, take shelter, and hold close the things we Hoppers hold dear: good friendship, a refreshing quaff, and unassuming, quality fare. Home at last. No Hopper is new to Umonoie, but this recent visit proved once again that sometimes the brightest gems are the unpolished ones. Umonoie favors simple, rustic décor and focuses, rightly, on an extensive menu of small, easy dishes that are perfect for sharing. After our waiter’s gracious overview of seasonal specialties, we began to make some very good decisions. Decision number one came in the form of a cold sake whose name loosely translates to “in the midst of a sea of clouds” and a second, potato-based Satsuma shiranami that goes by the handle “white waves”. As the waiter placed the glasses down at our little table, we followed up with starters, ordering the tsukemono, a plate of five types of radish whose crisp refrain could only match the bitter ring of our hearts. Nibbling on this plate of cured shallots, cucumber, diakon, radish, and a second cucumber with shisho, we began to feel—just a bit—more like ourselves. Takowasa, a small dish of wasabi-infused octopus, appeared next as if by magic from a secret stash of deep-water creatures that transform into shining little plates of nourishing happiness. We eagerly snapped up its offerings with our simple, wooden chopsticks and delighted in the fresh taste of the meat against the clean snap of spice. 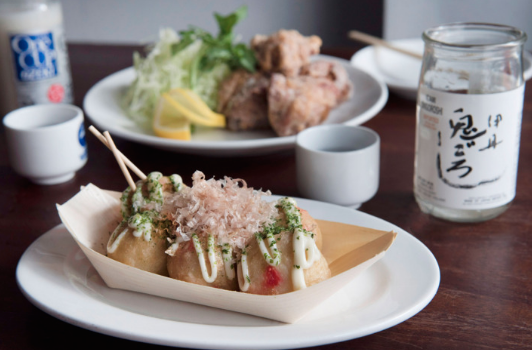 Hoppers get serious when it comes to an ultimate in izakaya dishes—any rendering of the egg. On this evening, we lapped up an order of the unagi no omelet, a fluffy pad of yellow dotted with succulent knobs of eel. In keeping with our deep-sea interests, we paired this with an order of the ika no aburiyaki—char grilled squid with tangy mayo. Full from our oceanic delights, but not yet sated for a proper night of hopping, we headed on to find ourselves at Wasan. Here, the two chefs, Kakusaburo Sakurai and Ryota Kitagawa (both of whom have cut their teeth in Japan and New York) team up with sake and wine sommelier Toshiyuki Koizumi to present seasonal dishes alongside an extensive collection of often-rare sake and shochu. While the team’s culinary ideas look to Japan, the ingredients are all locally sourced. We started things off with an order of grilled brussel sprouts nestled in a bed of guacamole infused with black vinegar. “Don’t ask me how they say this in Japanese,” the same Hopper joked. “It’s their interpretation.” It was, however, an interpretation that brought the best of the izakaya tradition to the fore—savory, a little sweet, an edge of acid. Perfect. Again we said “cheers” and toasted the future, however murky that future might now seem. To follow, we dug into fat, heaping bowls of noodle soup. “One of the great inventions of Asia!” a Hopper exclaimed. “We start drinking miso from the age of two, and everyone in Japan can cook noodles by their junior year in high school. So if mom’s not around, you still get to eat something warm.” The richly colored ceramic bowls rolled in together with sides of fried chicken and warmed rice balls. As we slurped and nibbled, sipped and dined, we couldn’t help but marvel at the balance of flavors and textures before us. Nothing taken for granted, each sensation new yet somehow familiar. Our journey through a couple of the best of the East Village’s izakaya spots proved to be a classic night of hopping, and it got us in a frankly reflective mood. If you can’t take stock with good friends on cold Fall evening as the world convulses with change even as the leaves drop, again, with their warm hues of closure, what can you do? There comes a time in the life of a Hopper when it all gets to be too much and the Hopper is exhausted. She still roams here and there, partaking of the seasonal delights and slurping freely from the grand ramen bowl in the sky, but she has become lax, unobservant, and ill-suited to the true rigors of Hopping. Sad, but true: we’ve been sliding. Happily, this state of affairs came to a resounding halt this past weekend, as the two founding Hoppers got together at Bar Goto, a fun, casual izakaya we had been meaning to try on the Lower East Side. With the winter behind us and the first of the spring buds emerging, we were pleased to celebrate the new season with the fresh dishes, and fine beverages, all on offer at this unassuming New York izakaya in the best possible iteration. Kenta Goto, formerly of the fine cocktail lounge Pegu Club, has set up a discreet and bustling spot where he pours a masterful mix of beverages infused with Japanese spirit and panache. I started things off with a sprightly “Far East Side”, which married a biting flavor of ginger with tequila and mellow sake. It was a serious brew that came, appropriately, in a classic coupe. Fellow Hopper went with the Sakura Martini, a sake-based offering grounded with pickled cherry flower in full splay. We followed this with a sampling of the Jasmine-Apricot 75, another sake-based drink spiked with sweet apricot, before parting beverage ways: one for a sensible Malbec, the other for a little Ryujin “Dragon God” sake. We Hoppers had a lot to catch up on (big Hopper news coming down the pike this season—we go international! Stay tuned for more…) so we were pleased to keep our glasses full and our plates brimming with the original takes on traditional Japanese bar snacks. Fries made of gobo root (or burdock, as it is more commonly known in the west) came long, slender, and perfectly crisp, wanting only a sprinkle of the side condiments on offer: powered wasabi root and finely-grated chili flakes. These seasonings brought out the earthy sensibility of the gobo root, with just the slightest overlay of ocean brine that this Hopper swears she could detect. Far more complex, and ultimately satisfying, than a usual order of fries, the gobo spears paired perfectly with the brightness of our drinks and were fun to dress up with sprinkles from our various and beautiful seasoning bowls. We next tried the Goto pickle platter, a rich assortment of pungent roots and vegetables that had been sauced up and arrived just in time to cut the light grease of our opening appetizer. Pickled beets glistened like red garnets, while the pickled taro root offered a starchy rejoinder. Nagoya, she was quick to add, is smack in the middle of the main island of Honshu, home of Toyota and where a great number of hard workers come to bars and izakaya just like Bar Goto to fill up and chill out. While neither of us had done any “real labor” on this warm, early spring Saturday in New York, so too would any workers be hard pressed to complain about the toothsome, full-bodied preparation of these wings: redolent with rich miso flavor, there was perhaps just as much sauce as meat, all of which we washed down easily with sake and wine. We gestured for our refills, promising each other it would be our last for the night, and continued to talk long into the evening in a little wedge of the Lower East Side that transported us, for a good few hours, back to Japan.